WOW! You really have put alot of work into this cancer risk test. While I knew a large percentage of the things in the diet, lifestyle and health factors, I really need to do alot more for myself and family in the environmental category. I'm always looking for more ways to protect myself and family. Thanks for being a cancer survivor and sharing your research and hard work with others. If you want to prevent cancer or permanently eliminate cancer you already have - YOU MUST FIND THE CAUSES! This test does not give risk factors you can’t do anything about, like age, race, genes, etc. but focuses on causes and risk factors you CAN change. And when you reduce these lifestyle risk factors, your cancer risk pertaining to genetics, age, and race is reduced also - the ones you were not supposed to be able to change! I once took an online cancer risk test which had less than ten questions. 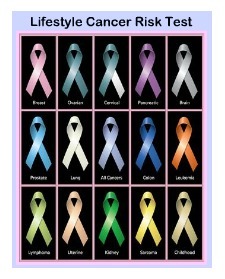 It said I was in the lowest risk category possible – and at the time I had six different types of cancer! I have spent more than four years finding causes of cancer no one talks about, and THESE CAUSES are some of the main reasons SO MANY people are getting cancer AND can’t get well. I have eliminated my cancers and done it several times – because the cancers kept coming back until I found AND eliminated the major causes. THAT is what I am giving you here on this 100 Question LIFESTYLE CANCER RISK TEST! When you provide the body with what it needs, it will not only heal itself – it will also stay well, whether it’s cancer or other top listed diseases. God’s Word says “A Curse Without A Cause Cometh Not” Prov. 26:2. That means in relation to getting cancer, something causes it. A report from the University of Oxford summarizing many studies on diet and cancer submitted to U.S. Congress concluded that only 2-3% of all cancers could be attributed to genes. That is GOOD NEWS which says we CAN be in control of our cancer risk! And that’s exactly what this Cancer Risk Tool will do for you! It will help you identify and implement many factors that will decrease your risk of cancer, and likewise, if you already have cancer, making these changes may help reverse the cancer growth in your body and give it the chance to heal itself – like God designed it to. That’s right, you may find the cause of your cancer in this list of risk factors and dramatically help to reduce the cancer cells in your body – just by implementing the lifestyle ‘Action’ statements after each question. Taking the 'Lifestyle Cancer Risk Test' was very eye-opening! To live a long healthy life, cancer-free, you must take in consideration your current lifestyle and that’s what this test has shown me. With a few changes I can become and stay healthy and fit, benefiting my body as a whole, physically and mentally. This test has shown me that gaining knowledge on nutrients that naturally heal and also awareness on what damages the body, (making it harder to fight diseases such as cancer), can help me live a healthier life. I plan to apply the information I gathered to my everyday life, making it a lifestyle choice to help beat disease. Everyone has cancer cells in their body as a natural process. It is WHEN risk factors cause them to grow out of control that we get in trouble. Now you will learn many of the reasons why - and know how you can change those. Cancer can be caused by various risk factors - ESPECIALLY WHEN SEVERAL RISK FACTORS ARE GROUPED TOGETHER. A common example of a high risk lifestyle could be a person who has high stress, eats a lot of lunch meat/hot dogs with super cancer-causing nitrites, works/lives/sleeps daily around wireless radiation and is taking HRT (hormone replacement therapy which feeds cancer cells). Two months ago I was diagnosed with an early stage of cancer in the breast. I chose natural treatment over radiation or chemo. After each frequency session, I have experienced less pain and itching. Now I feel slight pain only in my left breast when I am in a high radiation area or on my cell phone for an extended time. There is no pain or itching remaining in the right breast. In addition to the healthy frequencies I am getting, which I believe are the key to overcoming the cancer, I take graviola twice a day and use a protective shield when on the cell phone or my wireless laptop until I can get them set up properly with no wireless radiation in the house. This 'Lifestyle Cancer Risk Test' is giving the best information on the importance of setting up my environment and lifestyle so my body can heal itself and stay well. REMEMBER – ITS USUALLY NOT JUST ONE THING THAT CAUSES A CANCER DIAGNOSIS – ITS MANY LIFESTYLE RISK FACTORS GOING ON AT ONCE. KNOCK BACK MOST OF THOSE FACTORS AND YOUR RISK GOES DOWN DRASTICALLY! This LIFESTYLE CANCER RISK TEST has over 100 QUESTIONS with relating comments to help you know what action to take to reduce your cancer risk, divided into several different categories including ‘Diet’, ‘Lifestyle’, ‘Special Health Factors’ and ‘Environment’. This eTest and FREE Bonuses are in Adobe PDF file format for instant download. The Lifestyle Cancer Risk Test is being released at an introductory offer of just $9.95 – a fraction of the cost of one doctor’s office visit. Getting Cancer is Expensive! FREE BONUS could save your life. Take the test now – and get started reducing your cancer risk pertaining to the things you CAN do something about. when provided with what it needs!